In summer, accommodations at Lake Louise are even harder to come by than in Banff, so it’s essential to make reservations well in advance. Any rooms not taken by early afternoon will be the expensive ones. With beds for $100 less than anyplace else in the village, the 164-bed HI—Lake Louise Alpine Centre is understandably popular. 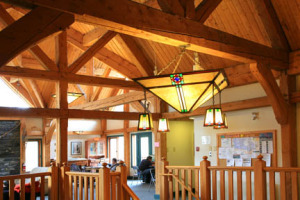 Of log construction, with large windows and high vaulted ceilings, the lodge is a joint venture between the Alpine Club of Canada and the Hostelling International Canada. Beyond the reception area is Bill Peyto’s Cafe, the least expensive place to eat in Lake Louise. Upstairs is a large timber-frame lounge area and guide’s room–a quiet place to plan your next hike or browse through the large collection of mountain literature. 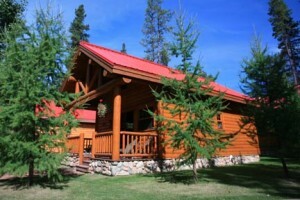 Other amenities include Wi-Fi Internet, a laundry, games room, and wintertime ski shuttle. Rates are discounted to $30 for a dorm and $82 s or d for a private room ($35 and $92, respectively, for nonmembers) October to May, including throughout the extremely busy winter season. The hostel is open year-round, with check-in after 3 p.m. In summer and on weekends during the winter season, advance bookings (up to six months) are essential. The hostel is on Village Road, less than one kilometer (0.6 mile) from Samson Mall. On the valley floor, Mountaineer Lodge (101 Village Rd., 403/522-3844, www.mountaineerlodge.com, May to mid-Oct., $189 to 239 s or d) offers large, functional guest rooms, many with mountain views and all with Wi-Fi Internet access. On the downside, the rooms have no phones or air-conditioning, and there is no elevator. Rates are halved during the first and last months of the operating season. 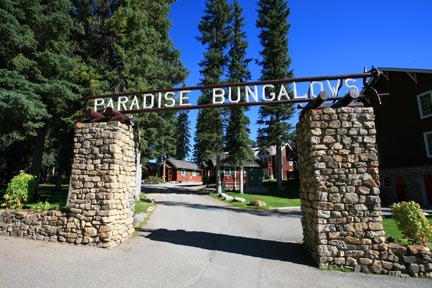 An excellent option for families and those looking for old-fashioned mountain charm is Paradise Lodge and Bungalows. This family-operated lodge provides excellent value in a wonderfully tranquil setting. Spread out around well-manicured gardens are 21 attractive cabins in four configurations. Each has a rustic, yet warm and inviting interior, with comfortable beds, a separate sitting area, and an en suite bathroom. Each cabin has a small fridge, microwave, and coffeemaker, while the larger ones have full kitchens and separate bedrooms. Instead of television, children are kept happy with a playground that includes a sandbox and jungle gym. On Wednesday and Sunday nights, a local naturalist presents an outdoor interpretive program for interested guests. The least-expensive cabins–complete with a classic cast-iron stove/fireplace combo—are $245 s or d, or pay $265 for a cabin with a big deck and soaring valley views. Twenty-four luxury suites, each with a fireplace, TV, one or two bedrooms, and fabulous mountain views, start at $290, or $325 with a kitchen. The Temple Suite, with all of the above as well as a large hot tub, is $345. 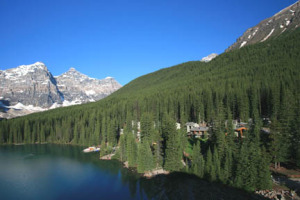 To get there from the valley floor, follow Lake Louise Drive toward the Fairmont Chateau Lake Louise for three kilometers (1.9 miles); the lake itself is just one kilometer (0.6 mile) farther up the hill. Historic Deer Lodge began life in 1921 as a teahouse, with rooms added in 1925. Facilities include a rooftop hot tub with glacier views, game room, restaurant (breakfast and dinner), and bar. The least-expensive rooms are older and don’t have phones. Rooms in the $200 to 250 range are considerably larger, or pay $275 for a heritage-themed Tower Room. 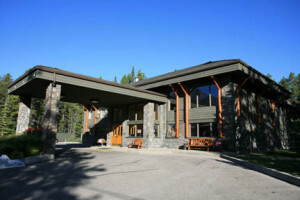 Deer Lodge is along Lake Louise Drive, up the hill from the village, and just a five-minute walk from the lake itself. Aside from the chateau, the Lake Louise Inn (210 Village Rd., 403/522-3791 or 800/661-9237, www.lakelouiseinn.com, from $220 s or d) is the village’s largest lodging, with more than 200 units spread throughout five buildings. Across from the lobby, in the main lodge, is a gift shop and an activities desk, and beyond is a pizzeria, a restaurant, a bar, and an indoor pool. Most rates booked online include breakfast. We live just down the road in Banff, but, still, have spent many nights ensconced in the beautiful log cabins at Baker Creek Mountain Resort, which lies along the Bow Valley Parkway 10 kilometers (6.2 miles) from Lake Louise back toward Banff. 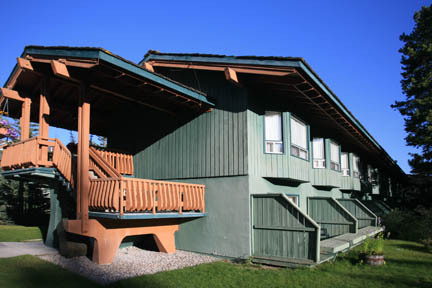 Each of the chalets has a kitchenette, separate bedroom, fireplace, and outside deck (complete with cute wood carvings of bears climbing over the railings). The Trapper’s Cabin is a huge space with a log bed, antler chandelier, wood-burning fireplace, double-jetted tub, and cooking facilities. A lodge wing has eight luxurious suites, each with richly accented log work, a deck, a microwave and fridge, and a deluxe bathroom. (Check the website for great off-season deals.) The restaurant here is highly recommended. Originally called Lake Louise Ski Lodge, the Post Hotel is one of only a handful of Canadian accommodations that have been accepted into the prestigious Relaix & Chateaux organization. Bordered to the east and south by the Pipestone River, it may lack views of Lake Louise, but it is as elegant, in a modern, woodsy way, as the chateau. 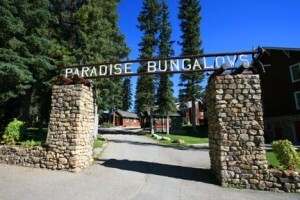 Each bungalow-style room is furnished with Canadian pine and has a balcony. Many rooms have whirlpools and fireplaces, while some have kitchens. Other facilities include the upscale Temple Mountain Spa, an indoor pool, a steam room, and a library. The hotel has 17 different room types, with 26 different rates depending on the view. 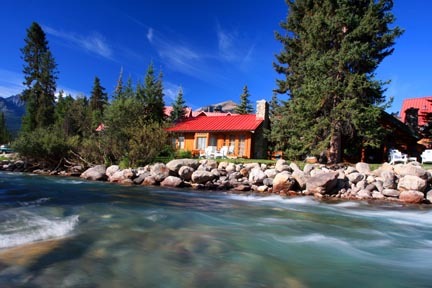 Between the main lodge and the Pipestone River are four sought-after cabins, each with a wood-burning fireplace. I’ve been lucky enough to stay at Moraine Lake Lodge many times, and the experience remains memorable—there’s something very special about bedding down for the night overlooking one of the world’s most beautiful lakes. Located at the lake for which it’s named, a 10-minute drive from lake Louise, this super-luxurious Moraine Lake Lodge was designed by renowned architect Arthur Erickson. The lodge is a bastion of understated charm, partially obscured from the masses of day-trippers who visit the lake and yet taking full advantage of its location beside one of the world’s most-photographed lakes. The decor reflects the wilderness location, with an abundance of polished log work and solid, practical furnishings in heritage-themed rooms. The rooms have no TVs or phones; instead guests take guided nature walks, have unlimited use of canoes, and are pampered with complimentary afternoon tea. 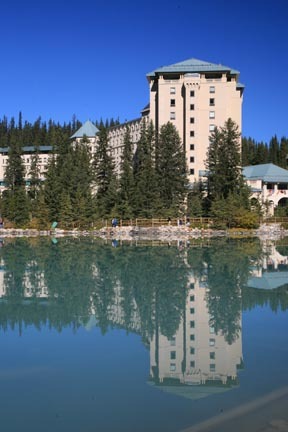 The famously fabulous Fairmont Chateau Lake Louise, a historic 500-room hotel on the shore of Lake Louise, has views equal to any mountain resort in the world. But all this historic charm and mountain scenery comes at a price. Rooms on the Fairmont Gold Floor come with a private concierge and upgraded everything for a little over $1,000. Official rates drop as low as $250 s or d outside of summer, with accommodation and ski pass packages often advertised for around $250 d. Children younger than 18 sharing with parents are free, but if you bring a pet, it’ll be an extra $30. If you’re prepared to lace up your hiking boots for a true mountain experience, consider spending time at <TP>), north of the Lake Louise ski resort and far from the nearest road. Getting there requires an 11-kilometer (6.8-mile) hike or ski, depending on the season. The lodge is an excellent base for exploring nearby valleys and mountains. 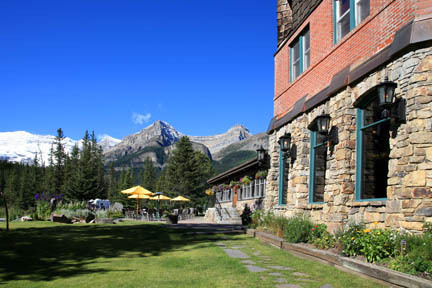 It dates to 1931, when it operated as a lodge for local Banff skiers, and is now a National Historic Site. Today it comprises a main lodge, sleeping cabins, and a wood-fired sauna. Accommodations are rustic–propane heat but no electricity—but comfortable, with mostly twin beds in the main lodge and cabins that sleep up to five. Rates include three meals daily, including a picnic lunch that guests build from a buffet-style layout before heading out hiking or skiing. The dining room and lounge center on a wood-burning fire, where guests come together each evening to swap tales from the trail and mingle with the convivial hosts Leo and Katie Mitsel.